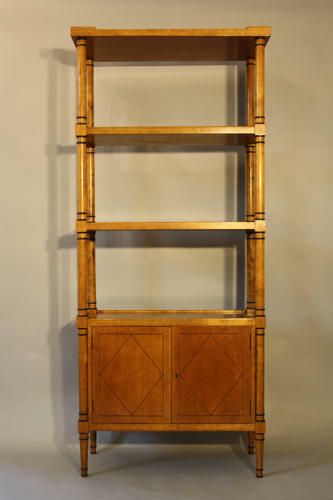 An elegant Biedermeier style bookcase possibly by Valenti. Spain c1950. Faux burr wood paint effect on body with black ebonised column detail. Would work as a wall piece or stand alone within a room as it is decorated and finished at the back. The overall colour of the piece is less orange than appears in images.